It's definitely Autumn now! Of course you can't have failed to notice that, the leaves are blowing from the trees, daylight fades at 5pm and the rain falls as much as the sun used to shine. Winter boots are replacing sandals and the central heating clicks on for the first time since spring. I haven't altogether let go of my comfy birkenstocks but I am embracing autumnal foods very happily. 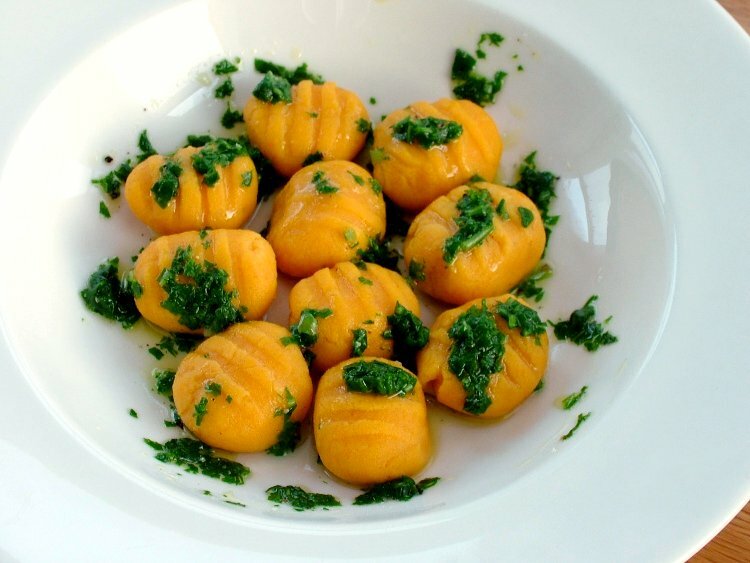 Here is a recipe for squash & sweet potato gnocchi. These are free from potatoes and wheat flour so are great for both gluten free and nightshade free diets. I was really disappointed when I thought that I would have to give up gnocchi, so I was relieved to realise that this wasn't the case. I was looking for a slightly bitter sauce to cut through the natural sweetness of the gnocchi, so - as pictured - I served the gnocchi here with a drizzle made of blanched dandelion leaves, garlic and olive oil. Making this again I will make the sauce with equal amounts of dandelion and either spinach or rocket to balance the strong flavour of autumnal dandelion, but I was pleased with the results as I have never tried cooking with dandelion leaves. Microwave* each vegetable for around 5 mins each for an 800W oven until they are soft and cooked throughout. Set to one side to cool whilst you prep the flour. Sieve 120g rice flour with 30g glutinous rice flour and just under 1/5 tsp xanthan gum. Once the vegetables are cool enough to handle, scoop the flesh from the skins (scrape to get every last morsel). Mash the vegetable flesh together with a potato masher (or whizz briefly in a food processor). If the puree is still warm, wait for it to cool (rather than cold) before you move on to the next stage. Beat the egg gently and then add to the vegetables, stir through until the egg is combined making a smooth thick batter. Season with a bit of salt and black pepper (taste if you don't mind the raw egg). Some squashes are drier than other varieties and this will dictate the amount of flour you need to add. Sprinkle one tablespoon of the flour mix at a time over the vegetable batter, and stir until throughly combined. Continue doing this until the batter is too thick to stir and needs to be kneaded by hand (for me this was after adding 75g flour (i used a buttercup squash which is quite firm and dry). Sprinkle your work surface with more of the flour mix and scrape the dough out onto the worktop. If the dough is still sticky, knead some more of the flour in until the dough holds it's shape. Form into a block and cut into 4 pieces, roll out 1 piece to make a long sausage no more than 2cm wide. With a wet knife, cut 2cm lengths along the length of the dough - it should make around 15-18 pieces per portion. Form the dough into gnocchi (see below for over complicated instructions - why didn't I take photos of the process?! Continue until you have rolled all the dough and then leave to dry for at least 30 mins before cooking. Pick about 20 small (less than 7cm) dandelion leaves and wash them. Fill a 1 pint bowl with cold water and set by the hob. Bring a little pan of water to the boil, drop the leaves in and let them boil for about 30 seconds. Lift them out with a draining spoon and dunk them straight into the cold water. Allow to cool for a minute or two, the scoop them out with your hand and squeeze hard to extract all moisture. Chop finely along with 1/4 clove fresh garlic. Put both in a small bowl and drizzle over some olive oil. Mix then taste, season with salt and pepper as required. Bring a large pan of water to a rolling boil. Salt - approx 10g per litre of water. Add gnocchi and let the pan come back to the boil. As soon as the gnocchi rise to the surface (1-2 minutes) they are cooked, so drain them and serve with the drizzle, and grated parmesan if you can eat it. Roll each piece of dough in the palm of your hand to make a ball (dust with a little flour if necessary). Balance the dough ball between your middle finger and your 3rd finger (ring finger in the UK) then grab a fork and drag the fork gently over the top of the ball - the dough will lengthen slightly as it moves and pick up the markings of the fork. If you drag the fork across your fingers, the gnocchi will be stopped by your ring finger and slightly squashed - that will make a little dent in the back of the gnocchi which increases the surface area and makes it cook quicker. The fork grooves help your sauce stick to the gnocchi meaning you get a perfect portion of sauce & dumpling with each forkful. *Microwaves: I recently contributed to forum chat on the UK Food Bloggers Association discussing microwaves. I realised then I don't really use mine much, and certainly not for cooking, just heating stuff up. Using the microwave to cook these vegetables was much quicker and much more efficient than the oven. I was suprised that the results were just as good as oven roasting, with a little caramelising on the cut surfaces of the squash. I will definitely try this again. Ah ha! I knew I received an email from you the other day saying you had a new post, but never made it here until now. These look really good (I'm especially pleased to find the tip about making the indent with the fork!). Would I be able to make them with regular flour? I've tried to make gnocchi before, but they came out a a little slimey. These look nice and firm, and most importantly, delicious! One of the things I enjoyed about making them is it's very similar to working with dough - I suspect that's why you like making them too? 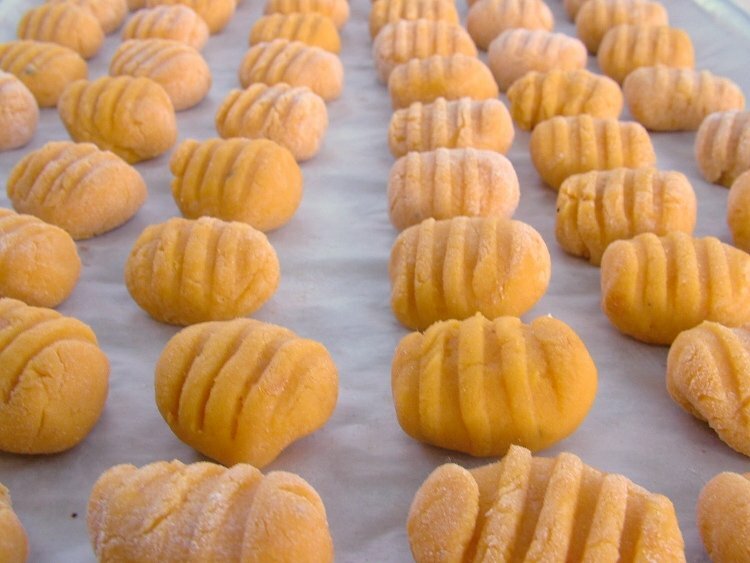 You can definitely make the gnocchi with wheat flour, omit the xanthan gum when you do. It is worth being aware that gluten free flour absorbs more liquid than wheat flour so you may need a bit more wheat flour to balance. The squash I used has very dry flesh, If your squash is a bit watery you will need to add another sprinkle of flour. Just wondered where you manage to find glutinous rice flour, please? You can find glutinous rice flour at most oriental food shops. Alternatively, if you have a coffee grinder you can grind down glutinous (sticky) rice to make the flour. I am not sure if there is anywhere in Weston but you will probably find some at Sweetmart ( who do mail order too - http://www.sweetmart.co.uk/), otherwise try Wai Yee Hong (http://www.waiyeehong.com/) in Eastville or Kin Yip Hon (http://www.kin-yip-hon.com/) in Bristol city centre.